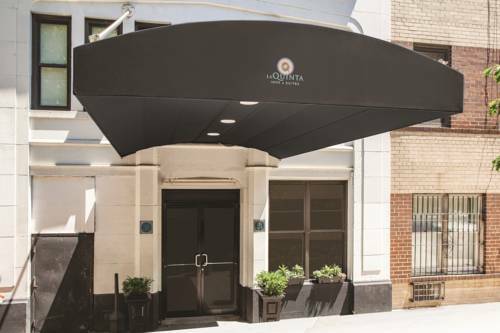 The La Quinta Inn & Suites New York City Central Park hotel is located on 71st street between Columbus and Central Park West, just steps away from Central Park, Lincoln Center and Columbus Circle. We are close to the Subway and train stations as well. We offer a variety of thoughtful amenities and services here at the La Quinta Inn & Suites New York City Central Park including free wireless high-speed Internet access, free Bright Side Breakfast, free calls within the U.S., in-room personal safes. Our front office staff will help guests arrange for car services and sightseeing activities. Guests also have access to the 24-hour business center. La Quinta Inn & Suites New York City Central Park hotel rooms are equipped with an iron, ironing board, coffee and coffee maker, hairdryer, speakerphone with voicemail as well as cable TV with movies on Demand. Please Note: There is a self-parking fee of $38 USD for standard vehicles and $45 USD for oversized vehicles and SUV's per day hotel with no in/out access. The Hotel uses Rapid Park located at 15 west 72nd Street one block away. Hotel occupancy fee of $3.50 USD per hotel room per night will be applied to all La Quinta Inn & Suites New York City Central Park reservations. All reservations must be canceled 24 hours prior to arrival to avoid being charged one night's room rate plus all taxes.